We all want that, right? Holy hell, sign me up! I devoured this book as soon as I got home! What really resonated with me was her tone that we all want to make changes in our life but once we see all of the areas we want to improve, it’s too overwhelming. The author breaks down basic research and wisdom to help you see than you can do it. Basically, everything is a habit. Good or bad. She helps you pick two or three things that you would like to change and implement into your life. Once these become habit after a month, it’s much easier to keep them and start working on a few new ‘bad habits’ the next month. Understand that Rubin doesn’t just tell you to make a list of changes you need to make and start tackling them. She helps you look deeper into the root of your outlook and how to find the underlying habits you need to improve to be happier. Taking a nap if I need it. Weekend afternoons are the sweet spot, but in a pinch I’ll take a quick one on the sofa with a kiddo watching Nick Jr. It’s amazing what a snooze can do for a bad mood! Seeing a movie by myself. When I was at home full-time with three little boys this was like a lifeboat! Immersing in a story, in the dark helped to hit the reset button. To this day when I’m getting frazzled my hubby will ask me if I need to go to a movie. Works miracles, try it! Picking up the floor of the family room before bed. (I’m not 100% with this one.) I’m crabby if I come downstairs in the morning and need to dodge toys. Then I’m being grouchy at the kids before they’ve even had their E’ggos. A quick sweep of the area before bed helps me visually feel like I’ve got a fresh start to the day. I’m sure there are more but they’ve became such habit I don’t remember the time before. 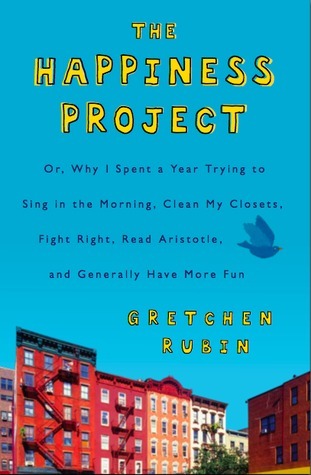 If you are struggling to find happiness in your everyday life, please check out this book. I hope it makes you happy!